BHOPAL: A three year old tigress has been translocated from Panna tiger reserve to Satpura national park on Saturday. 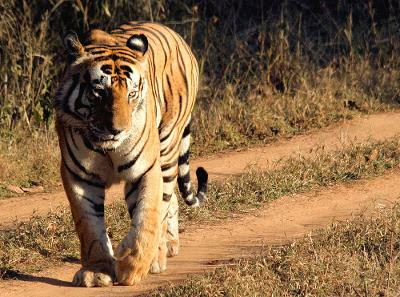 Director of the national park Vivek Jain said, 'this tigress became threat to the animals and the villagers. Following conflict with villagers, the tigress was also threatened. After tranquilisation by joint team of the two parks, in the late afternoon, the tigress was placed in a truck. A veterinarian- Dr Sanjeev Gupta- and other staff also accompanied her. P213-23 is likely to complete her over -350 km journey by Sunday morning. Last year, P213-22, her sibling, had already moved out to the neighbouring Uttar Pradesh. In 2015, the radio-collared tigress wandered in the jungles of Ranipura sanctuary inChitrakoot, a district of Uttar Pradesh with some of its geographical area located in Satna district of Madhya Pradesh.